Gorwydd (pronounced Gor-with) Caerphilly is a mature caerphilly produced by the Trethowan family. It used to be made on Gorwydd Farm in the Welsh mountains, but the dairy has now moved over the border to Somerset. It’s made according to a traditional recipe with raw unpasteurised cow’s milk and a traditional animal rennet. 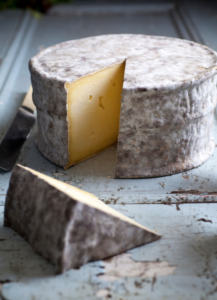 However, unlike traditional caerphilly that was sold young, Gorwydd is matured for three months. This maturation allows texture to develop through the cheese: a natural rind, surrounding a creamy mushroomy layer, with a crumbly lemony centre. Gorwydd has won all sorts of awards. Most recently, “Super Gold” at the 2016 World Cheese Awards in San Sebastián, making it one of the top 66 cheeses in the world.